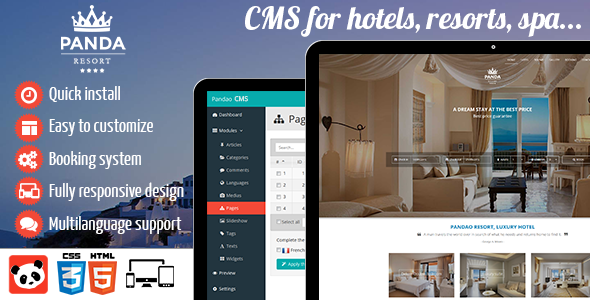 Panda Resort 4 - CMS for Single Hotel - Booking System - CODELISTPRO | Free Premium Scripts, Plugins, Apps Source Code. Panda Resort a web software to create and manage websites for hotels, resorts, spa. Web agency or just an owner of hotel, resort, spa, lodging or bed and breakfast? This CMS is built for you! Add your rooms. Manage your prices. Create original activities and tours, extra services and follow up your bookings! Pandao Resort uses Pandao CMS, a Content Managment System which contains a simple, ergonomic and complete admin panel which allows you to manage easily the content of your website coupled with an easily customizable template. Several new specific modules: bookings, rooms, rates, currencies, extra services and facilities.